Back in April, Google announced they are bringing TV show search to the search results but then the Google blog post went missing. It is unclear why but the blog post is completely gone and not even on the new blog, as far as I can see. However, you can access it on the DoubleClick blog - but it is a different version than what was on the Inside Search blog. In any event, it seems like the search feature is now live. 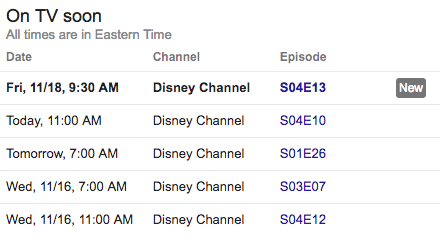 Pete Meyers spotted it and posted on Twitter that if you search for [doc mcstuffins], a popular Disney Channel show, it shows a box on desktop and mobile for "On TV soon."